This composite image shows the central regions of the nearby Circinus galaxy, located about 12 million light years away. 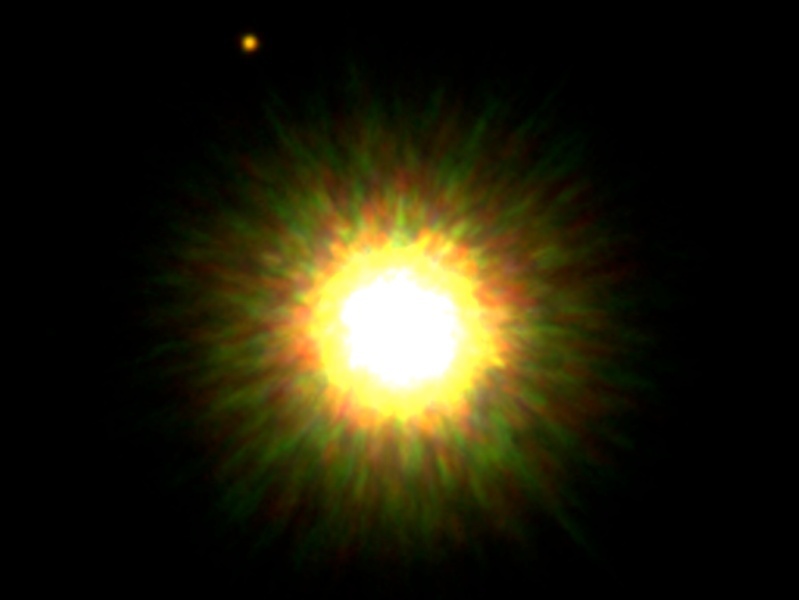 Data from NASA’s Chandra X-ray Observatory is shown in blue and data from the Hubble Space telescope is shown in yellow (“I-band”), red (hydrogen emission), cyan (“V-band”) and light blue (oxygen emission). The bright, blue source near the lower right hand corner of the image is the supernova SN 1996cr, that has finally been identified over a decade after it exploded. The supernova was first singled out in 2001 as a bright, variable object in a Chandra image. Despite some exceptional properties, its nature remained unclear until years later, when scientists were able to confirm this object was a supernova. Clues in data from the European Southern Observatory’s Very Large Telescope led the team to search through data archives from 18 different telescopes, both in space and on the ground, nearly all of which was from archives. This is a remarkable example of the new era of `Internet astronomy’. 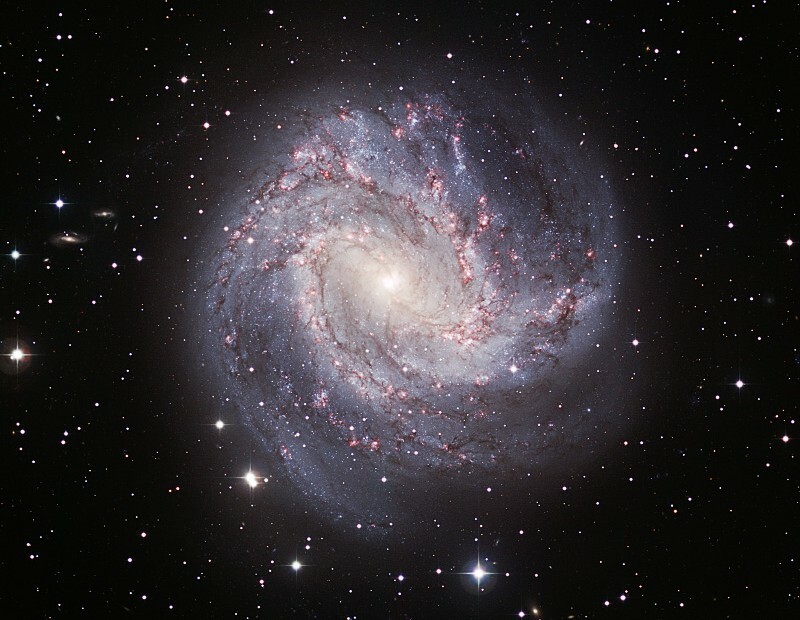 Big, bright, and beautiful, spiral galaxy M83 lies a mere twelve million light-years away, near the southeastern tip of the very long constellation Hydra. Prominent spiral arms traced by dark dust lanes and blue star clusters lend this galaxy its popular name of the Southern Pinwheel. But reddish star forming regions that dot the sweeping arms highlighted in this sparkling color composite also suggest another nickname, The Thousand-Ruby Galaxy. 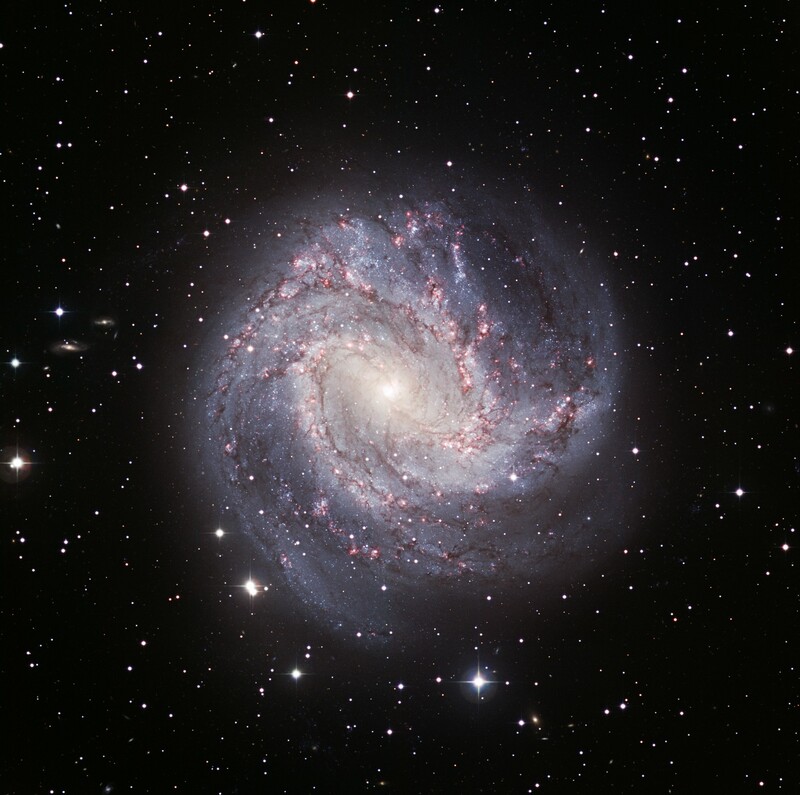 About 40,000 light-years across, M83 is a member of a group of galaxies that includes active galaxy Centaurus A. 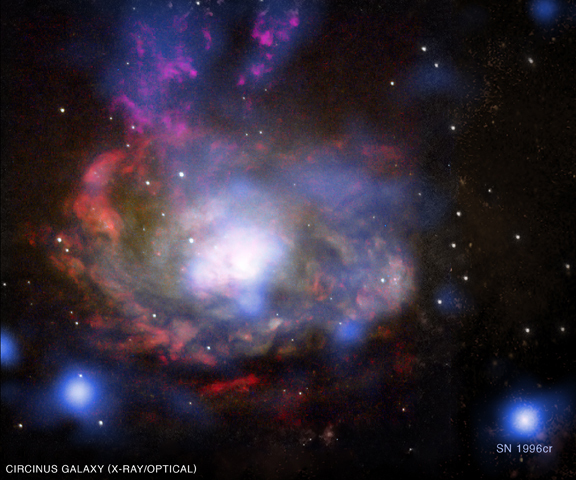 The core of M83 itself is bright at x-ray energies, showing a high concentration of neutron stars and black holes left from an intense burst of star formation. The sharp image, based on archival data from the European Southern Observatory’s Wide Field Imager camera, also features spiky foreground Milky Way stars and distant background galaxies. 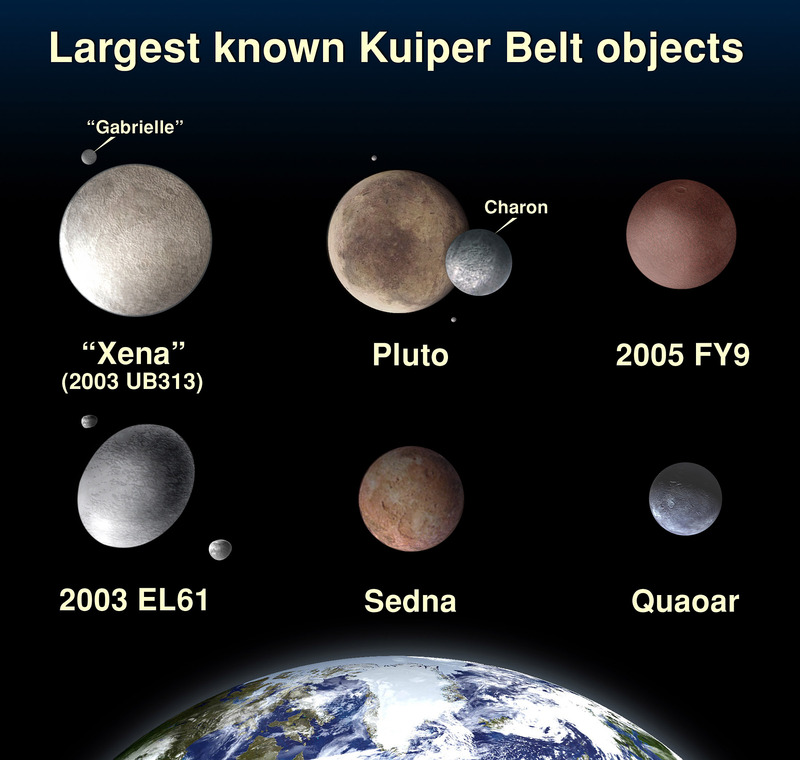 One of the strangest objects in the outer Solar System was classified as a dwarf planet last week and given the name Haumea. This designation makes Haumea the fifth designated dwarf planet after Pluto, Ceres, Eris, and Makemake. Haumea’s smooth but oblong shape make it extremely unusual. Along one direction, Haumea is significantly longer than Pluto, while in another direction Haumea has an extent very similar to Pluto, while in the third direction is much smaller. Haumea’s orbit sometimes brings it closer to the Sun than Pluto, but usually Haumea is further away. 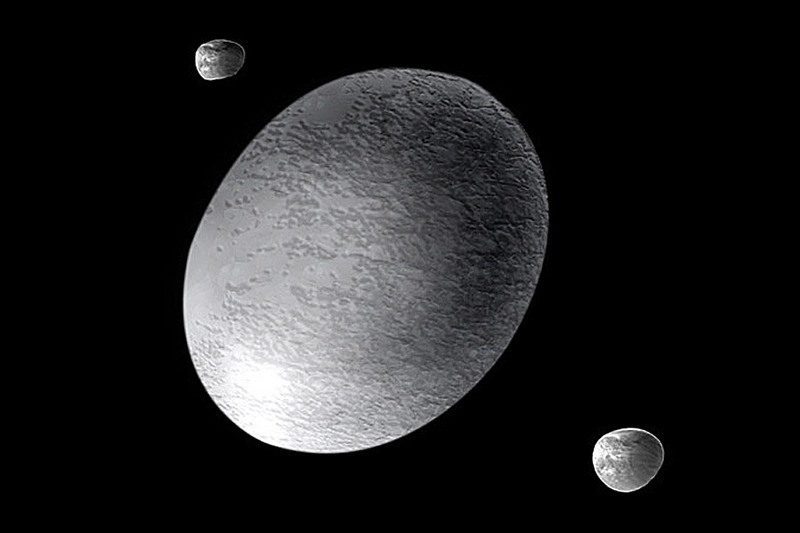 Illustrated above, an artist visualizes Haumea as a nearly featureless ellipsoid. Quite possibly, however, Haumea has interesting craters and surface features that currently remain unknown. Originally discovered in 2003 and given the temporary designation of 2003 EL61, Haumea was recently renamed by the IAU for a Hawaiian goddess. Haumea has two small moons discovered in 2005, recently renamed Hi’iaka and Namaka for daughters of the goddess. 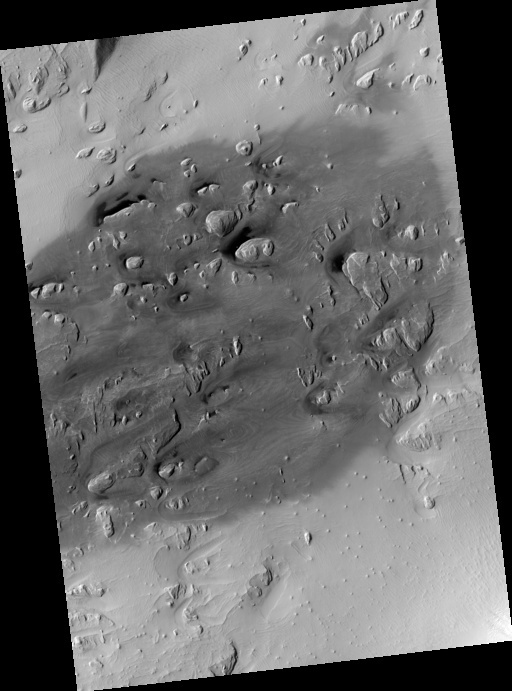 This image covers a relatively dark-toned patch of ground west of the Olympus Mons volcano. 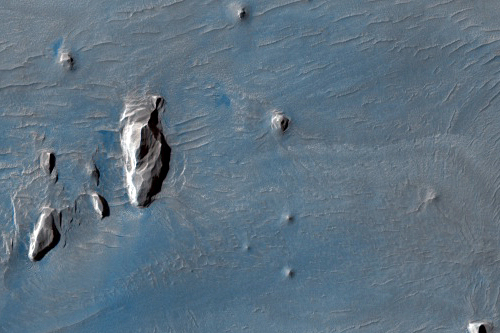 This spot is one of several dark areas in this region of Mars. 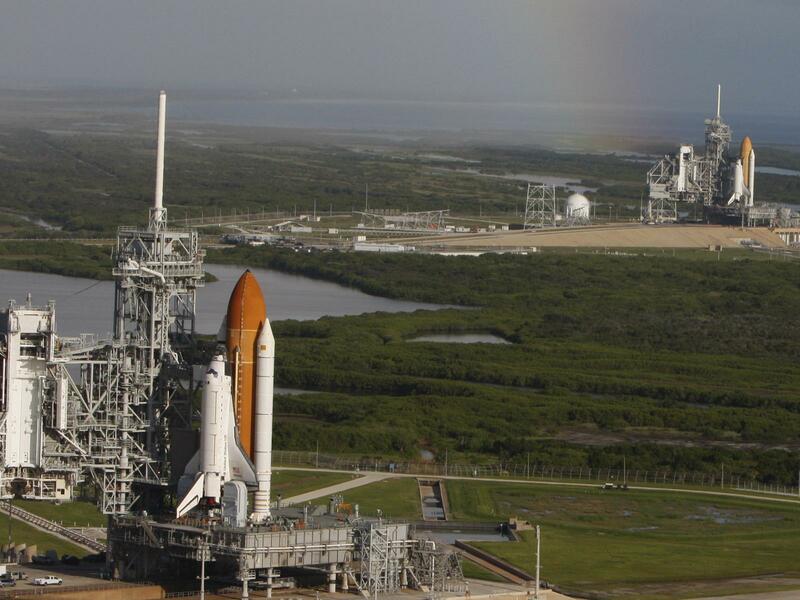 These dark spots are distinctive because much of the surrounding area appears to be covered by light-toned dust. In pre-HiRISE images, the origin of this dark spot was ambiguous. 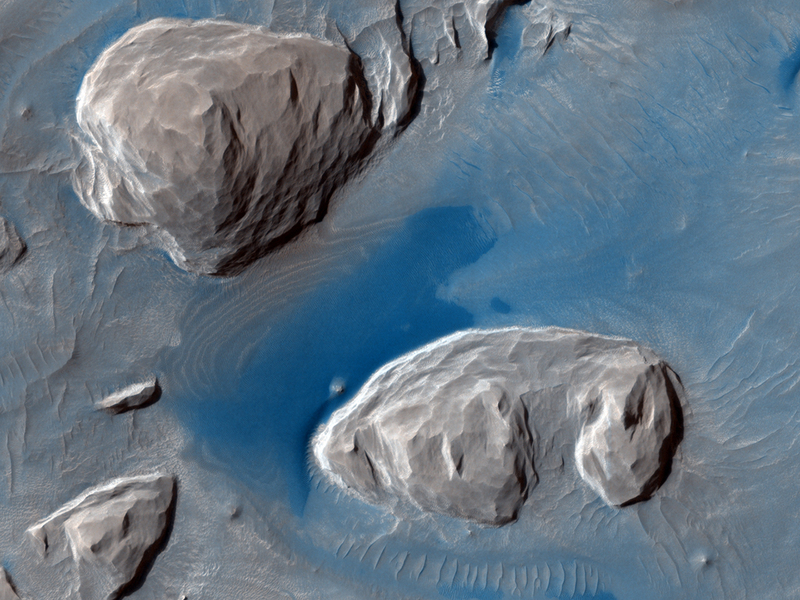 This HiRISE image reveals that the dark color is likely the result of accumulations of basaltic sand (smooth, blue-colored material in the color swath) on top of otherwise relatively dust-free bedrock. For a moment on August 1st, the daytime sky grew dark along the path of a total solar eclipse. 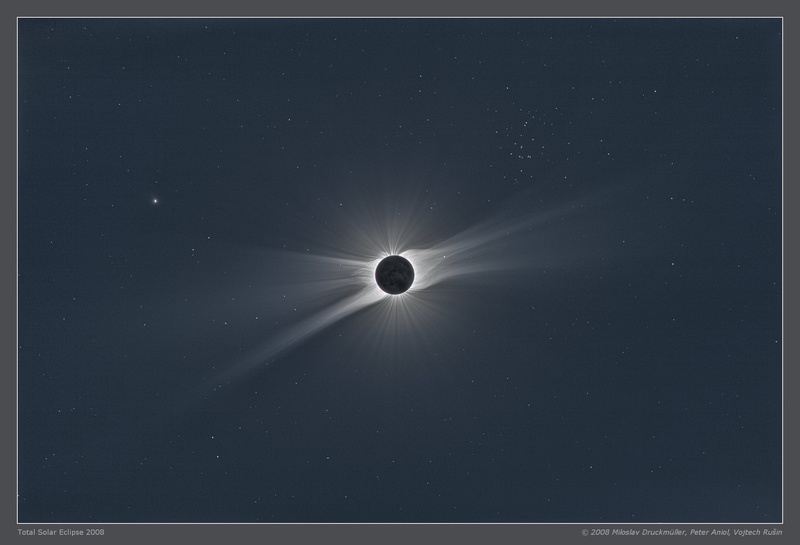 While watching the geocentric celestial event from Mongolia, photographer Miloslav Druckmuller recorded multiple images with two separate cameras as the Moon blocked the bright solar disk and darkened the sky. This final composition consists of 55 frames ranging in exposure time from 1/125 to 8 seconds. It spans nearly 12 degrees, with the relative position of the Moon and Sun corresponding to mid-eclipse. On the left is bright planet Mercury, but many stars are also visible, including the Praesepe star cluster (also known as M44 or the Beehive cluster) in Cancer, above and to the right of the silhouetted Moon. 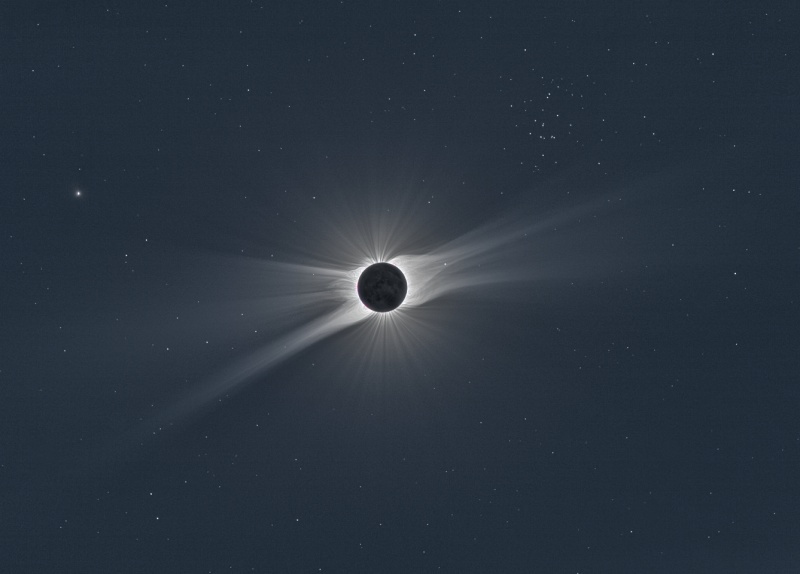 Remarkably, the nearly perfect conditions and wide range in individual exposures allow the composite picture to register the lunar surface and follow the delicate solar corona out to a distance of nearly 20 times the radius of the Sun. In fact, the composite presents a range in brightness beyond what the eye could see during the eclipse. Large regions of Saturn’s night side are illuminated by the planet’s gleaming rings. Except for a sliver of the sunlit crescent at left, this view shows a part of the planet lit almost entirely by ringshine.The southern hemisphere, at bottom, receives its illumination from sunlight that strikes the rings’ southern face and is reflected onto the planet. The northern hemisphere, at top, is lit by the feeble light that wends its way through countless ring particles to emerge on the rings’ north face. This view was acquired from about 44 degrees above the ringplane. At bottom, the planet’s shadow stretches across the D and C rings. Four days after Hurricane Ike swept ashore over the Gulf Coast of the United States, the clouds cleared enough for the Moderate Resolution Imaging Spectroradiometer (MODIS) on NASA’s Terra satellite to view the storm’s impact. Taken on September 17, 2008, the top image shows a wide swath of coastal flooding not present on September 7, before Ike came ashore. In this type of image, made by combining infrared and visible light, water is black or dark blue, easily visible against the surrounding landscape. If seen in visible light alone, the way a person would see it, the flooded region and the surrounding land would blend together in shades of brown. Clouds, light blue and white, still partially obscure the view of the ground. The images show the extent of coastal flooding that remains after four days. Ike was a monstrous storm, covering much of the Gulf of Mexico in the days before the storm came ashore. (See Hurricane Ike on the Earth Observatory.) The storm pushed a wall of water into the coast as it came ashore. The sheer size of the storm guaranteed that the surge covered a wide swath of Gulf Coast real estate. From east to west, this image stretches from Vermilion Bay, Louisiana, to East Bay (the eastern arm of Galveston Bay near Houston), Texas, a distance of about 275 kilometers (171 miles). The floods also extend a long distance inland. The strip of black, indicative of floodwater, goes as much as 25 kilometers (16 miles) inland near the Texas/Louisiana border in this image. Much of the landscape in this region is marshland, which tends to retain floodwater longer than other types of landcover. 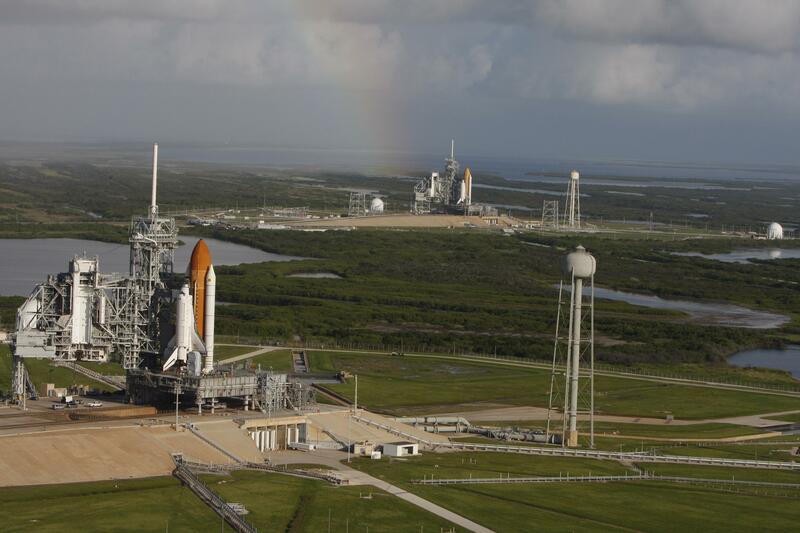 You can download a 250-meter-resolution KMZ file comparison of the region before and after Hurricane Ike suitable for use with Google Earth. NASA image created by Jesse Allen, using data provided courtesy of the MODIS Rapid Response team and the Goddard Land Processes data archives (LAADS). Caption by Holli Riebeek. The bright arc of material in Saturn’s G ring is seen here as it rounds the ring’s edge, or ansa. The ring arc orbits Saturn along the inner edge of the G ring.Cassini spacecraft scientists think the arc contains a population of relatively large, icy particles held in place by a gravitational an orbital resonance with the moon Mimas. Micrometeoroids collide with the large particles, releasing smaller, dust-sized particles that brighten the arc. The plasma in the giant planet’s magnetic field sweeps through this arc continually, dragging out the fine particles and creating the G ring. The ring arc orbits Saturn along the inner edge of the G ring. The diffuse glow at left shows the extended nature of this faint ring. The ring moved against the background stars during this exposure, creating the star trails seen here. The upper, brighter ring section is the one closer to Cassini. Here, the ring arc is coming toward Cassini and moving toward right as it rounds the ansa. The image was taken in visible light with the Cassini spacecraft narrow-angle camera on Aug. 22, 2008. The view was acquired at a distance of approximately 1.2 million kilometers (740,000 miles) from Saturn and at a Sun-Saturn-spacecraft, or phase, angle of 13 degrees. Image scale is 7 kilometers (4 miles) per pixel in the radial, or outward-from-Saturn, direction. Located just 500 light-years away toward the constellation Scorpius, this star is only slightly less massive and a little cooler than the Sun. But it is much younger, a few million years old compared to the middle-aged Sun’s 5 billion years. This sharp infrared image shows the young star has a likely companion positioned above and left – a hot planet with about 8 times the mass of Jupiter, orbiting a whopping 330 times the Earth-Sun distance from its parent star. 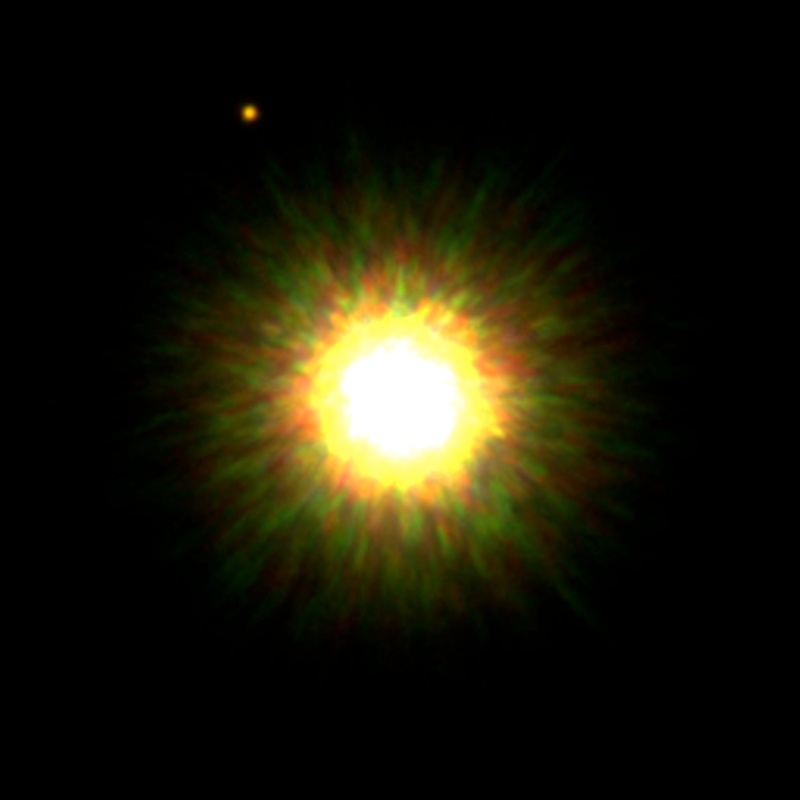 The young planetary companion is still hot and relatively bright in infrared light due to the heat generated during its formation by gravitational contraction. In fact, such newborn planets are easier to detect before they age and cool, becoming much fainter. Though over 300 extrasolar planets have been found using other techniques, this picture likely represents the first direct image of a planet belonging to a star similar to the Sun.